The teaser of Anjaan was premiered yesterday night, and one must say that the film promises stylish gangster fare with Suriya in top form. With Yuvan's peppy 'Bang Bang Bang' number running in the background, we are presented visuals of the movie in the 70 seconds long teaser, which has been cut with expertise by master editor Anthony. Soori and Brahmanandam take care of the comedy quotient, Chitrangada Singh and Maryam Zakarai provide some oomph in ample measure, Manoj Bajpai heads the villainy department, Santosh Sivan's work shines through in the action scenes while a few visuals of Samantha are also there to provide the cutesy quotient to the teaser. Suriya is all style, 'superstar swag' and looks his most dashing till date as Raju 'Bhai'. He is deadly, acrobatic and puts on the required attitude in the action scenes and is at ease mouthing a punchline in the end. In his other avatar, he is seen with spectacles and crutches, and the surprise element rests on this particular role. There is little that is left to be said about Vidyut Jamwal's looks and physical presence, and seeing him team up and walk alongside Suriya, is a highlight element of the teaser. There are also a few 'over the top' moments in the teaser such as the one when a support character shouts, 'Raju Nahi, Raju Bhai Bholo'. 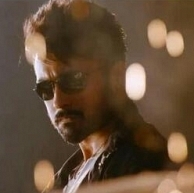 Lingusamy ventures into gangster territory again after Bheema and though the traces of the earlier movie in the teaser can't be ignored, Anjaan surely seems like a treat for ardent Suriya fans. July 17 and August 15 are the upcoming important dates for Anjaan as the music and movie would release on these dates respectively. People looking for online information on Anjaan, Anjaan teaser, Anjaan teaser review, Suriya will find this news story useful.